UPDATE 4/15/16: I realized today that this post needed to be updated. 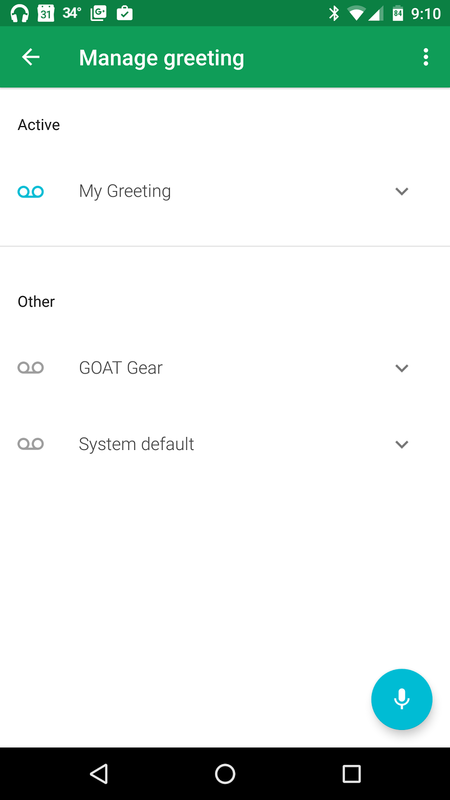 As a result to a previous Project Fi APp update back in January, you are able to now create new custom greetings using the app without the need for adding a new verified phone for recording. When you go into the Fi app, under the Account section, click on Voicemail. In there you have an option to manage greetings. On the bottom right, there is a Fi Blue microphone floating action button (FAB). Tap that and you will be presented with a screen to record the greeting. You may be asked to give the app special permissions to access your microphone. Tap the big Fi Blue record button and start speaking to your phone to record the greeting. After recording, you can listen, discard or keep the greeting. Next you will be prompted to name and save the greeting. After tapping save, the greeting just recorded will be uploaded and become the active greeting. You can then change which is active on the next screen. Hope this makes recording custom greetings easier for you. 1/19/16: PLEASE NOTE: There is an issue with this feature being looked into. Wanna have fun with your Project Fi account? Want to have fun with callers leaving voicemails? A neat feature that existed when I used Google Voice was to have custom greetings for certain people in my contacts. Its really easy to do, and gives a nice personalized feeling to callers. For example, let's say one of your biggest clients name is Bob. You can set a custom greeting, something like "Hey Bob, so glad to hear from you. I am sorry I am not available right now, but please know your business is very important to me, and I will return your call as soon as I possibly can." Or, for your wife: "Hey sweetie, sorry to miss your lovely voice. I will call you back as soon as I can, Kisses!" Or your brother: "What up bro, leave me a message and I will call you back on the flip side"
First, you need to record additional voicemails. 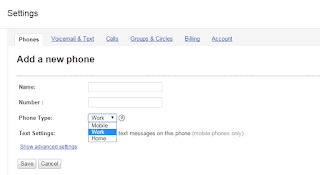 To do that, go to fi.google.com and scroll all the way to the bottom and click on Google Voice towards the right side. 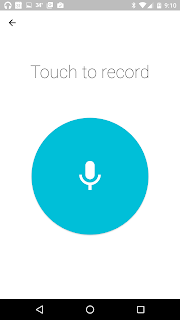 Once in Google Voice, click the gear icon on the top right and choose settings. Next, on the phone tab, you will need to add a non-Fi phone number to use to record the greeting. Once you are done recording your necessary greetings, you can delete this phone. Click on Add a Phone, enter the necessary information and save. The next screen will give you instructions on verifying your phone. 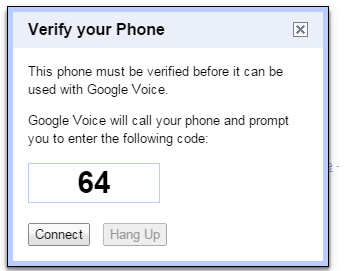 Once the new phone is verified and activated, go to Voicemail and Text. Click on Record Greeting. 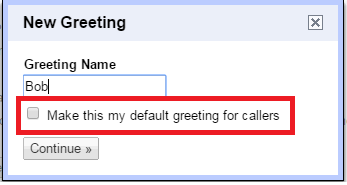 On the next page, name your greeting and make sure Make this my default greeting for callers is not checked. 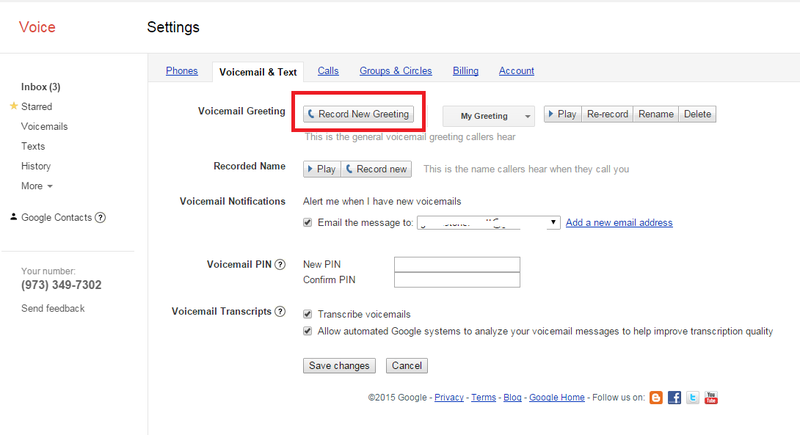 You will be prompted to select a phone for Google to call you for recording the greeting. 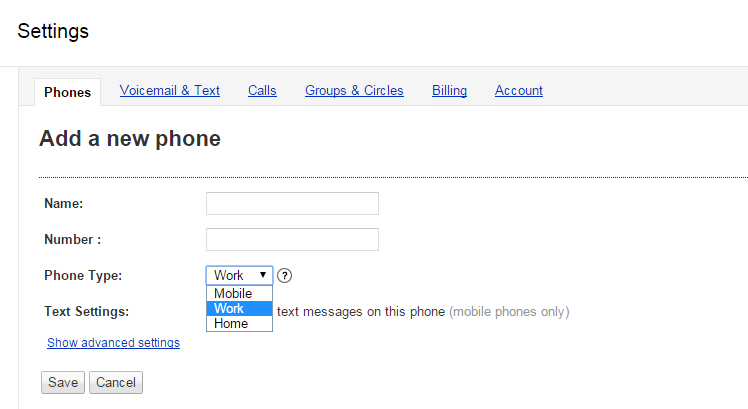 In the drop down select the phone you just entered, click connect. Your phone will ring, just follow the prompts and record your new greeting. Next, go to your contacts page (contacts.google.com) and create a new contact group for the people that will receive this greeting. Go to contacts.google.com. On the left side, under groups, click New Group, name your group, and then use the Blue Circle with a plus sign to add people to that new group. Note, if the group already exists you can skip this step. 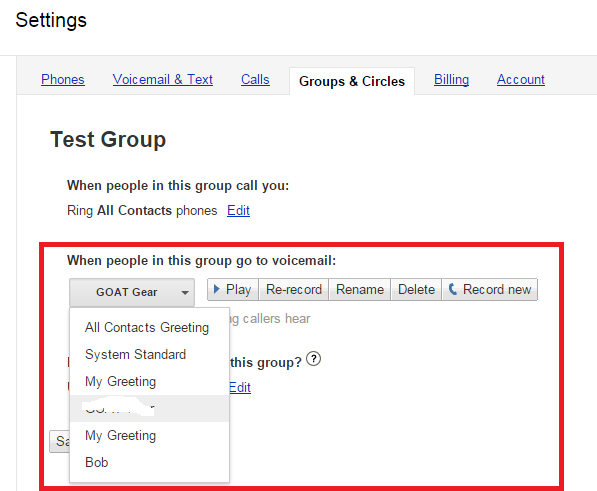 Now, go back to the Google Voice settings page and select the Groups & Circles tab. Under there you will see the list of all your Groups, Circles, All Contacts and Anonymous Callers. 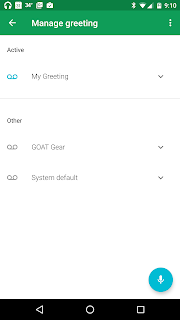 Here you can edit how this Group is handled and select what Greeting they receive. From the drop down, select the Greeting and choose save. 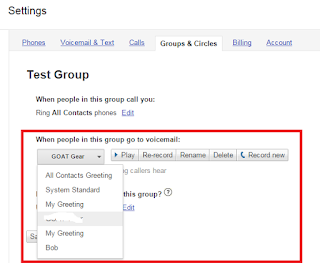 Now any contact you have in that Group will hear that Greeting when they receive your voicemail. Now, repeat those steps for every custom greeting you want. 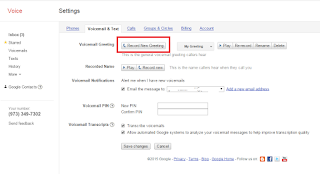 Then if necessary, go back to the phone tab in Google Voice settings to remove the phone you added. Otherwise, all calls you get to your Fi number will forward to that number you added. Pretty simple, and a awesome feature if you ask me. Hi Scott: I have a professionally recorded (Voice Over) Greetings. Is there a way to directly upload this mp3 file - so that quality is not lost. Yes that's what I did and not happy with quality. Thanks anyways. Funny it used to be a option to upload a custom message - high quality with music bed etc . . now nothing? Yes that has been reported by many. 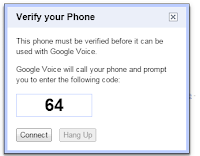 If you are trying to record a custom greeting using the Google Voice(Fi) website you need to add a phone to call in with for recording. Why thank you so much. Got lots of videos I am working on tonight to rollout during the next week or so. Hey Scott, Know of anyway to change my associated Caller ID on Project FI? The one others see when I call? What would you want to change it to? The only thing I am aware of is blocking your caller ID, but not changing it. I tried this and it didn't work for me. I created different groups and recorded different voicemail for each of them. They all just got my normal voicemail.